John Charles Fremont (1813-1890) – Explorer, surveyor, military man and politician, Fremont was born on January 21, 1813, in Savannah, Georgia. When his father died when John was just five years old, the family moved to Charleston, South Carolina where he attended college before being expelled for irregular attendance. However, he’d done well in math and got a teaching job on a warship. His career as an explorer began when he left the Navy to join the United States Topographical Corps, which later became the Army Corps of Engineers. In 1838, he was commissioned a second lieutenant by President Van Buren and in that year and the next, he took part in Jean Nicollet’s expedition to the plains between the upper Mississippi and Missouri Rivers. Becoming an expert in geology and topography, he headed his own expedition into to survey the Des Moines River in 1841. On October 19, 1841, he secretly married Jessie, daughter of Thomas H. Benton, even though her parents objected to the union on account of her age. Landing in California with his wife, Fremont led much of the revolt in Alta that led to the state’s admission in the Union. 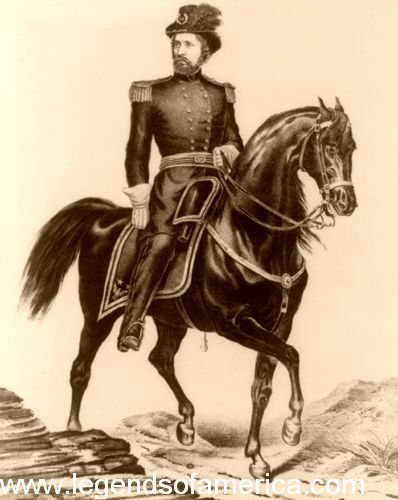 During the Mexican-American War he would be appointed civil governor by Commodore Robert Stockton. Trouble brewed within the American ranks when Fremont refused to recognize brigadier general Stephen Kearny’s authority to organize a new territorial government. After Washington D.C. confirmed Kearny’s authority, Fremont was arrested for mutiny, disobedience and improper conduct. Kearny would return with Fremont to Fort Leavenworth in August of 1847 for trial. Fremont was found guilty, however, his sentence was commuted by President Polk, and he was reinstated. When gold was found on the land that he had purchased in the Sierra foothills, he became a millionaire. He then moved to politics, serving as one of California’s first senators. The first Republican National Convention in 1856 nominated him for the presidency, and he received 114 electoral votes, but James Buchanan received 174 and went on to win the election. Soon after the Civil War began, he was made major-general and assigned to the command of the Western Department, with headquarters at St. Louis, Missouri. On August 31, 1861, he proclaimed martial law and the emancipation of the slaves belonging to those in arms against the government. President Abraham Lincoln endorsed the proclamation, except that part concerning emancipation, but this, Fremont refused to rescind, and it was finally annulled by order of the president. This, and other complaints caused him to be relieved of his command, but the following spring he was placed in command of the mountain district in Kentucky, Tennessee, and Virginia. 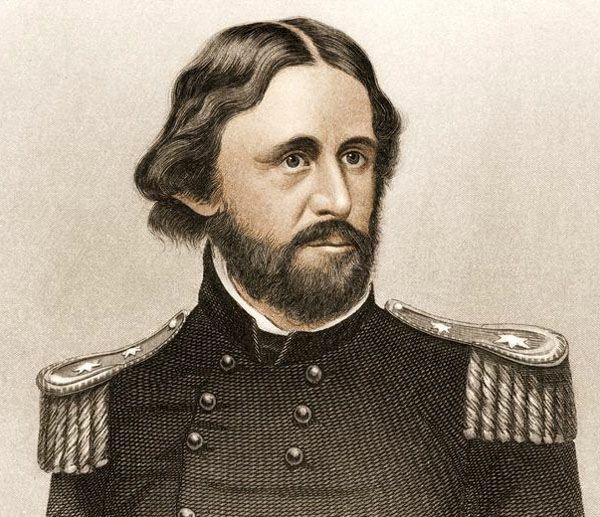 When his command was made a part of General John Pope’s Army of Virginia, Fremont asked to be relieved. His request was granted, and this ended his military career. Afterward, he lost his fortune through bad investments with railroads and moved to Arizona, where he was made territorial governor from 1878 to 1883. In 1887 Fremont returned to California. General Fremont was the author of various works, most of them relating to his explorations. He died on July 13, 1890, in New York City. © Kathy Weiser-Alexander, updated May 2018. I learned a lot from this website.